Another day, yet another odd application found in the iTunes App store. 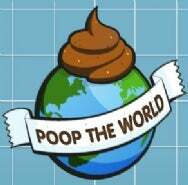 'Poop The World' from SWS Digital allows users to track their bowel movements and share them with the world, all in real-time. Talk about "too much information." The application uses the iPhone's built in GPS feature to locate the user as they poop. This information is then shared instantly on the official website. The site also lets you keep tabs on who poops the most, and if you want you can even share your poo data with your friends. Insightful. Although this new app ain't no stinker, it would seem the various offerings finding their way onto the App store are getting more bizarre as each day passes, with a Cannabis application which helps you find weed, to a drinking app that gauges how drunk you are. Meanwhile, Apple has a track record for rejecting apps over profanity. Check out Poop The World on the PC World App Guide.